Danbury Fair’s food court plays up a park-like setting to lure lifestyle shoppers attracted by hot new retail tenants. It would take window shoppers a number of repeat visits to Danbury Fair mall to reach visual satiety. After a day of trend spotting, it’s not surprising that denizens of the material world expect more from the adjoining food court than just another Formica fortress with lightweight chairs and undersized tables. Macerich, owner and manager of the 1.3 million-square-foot regional shopping center in southwest Connecticut’s affluent Fairfield County, saw an opportunity to ring up higher sales with a park-like design concept that makes the food court as “must see” as the stores. 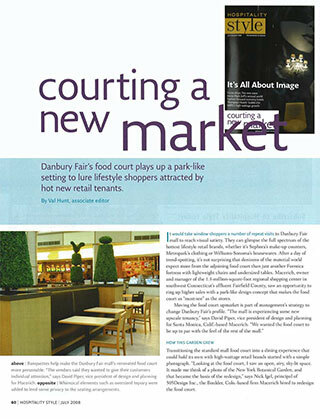 Moving the food court upmarket is part of management’s strategy to change Danbury Fair’s profile. The first step in the shift from institutional to inviting was to reconfigure the space. Mass-market appeal may be great, but mass-feeding vibe is not. Banquettes help make the Danbury Fair mall’s renovated food court more personable. “The vendors said they wanted to give their customers individual attention,” says David Piper, VP of design and planning for Macerich. Whimsical elements such as oversized topiaries were added to lend some privacy to the seating arrangements. These fanciful green giants do more than add a welcome touch of nature. The 13 foot topiaries remind shoppers they are not in a typical food court.